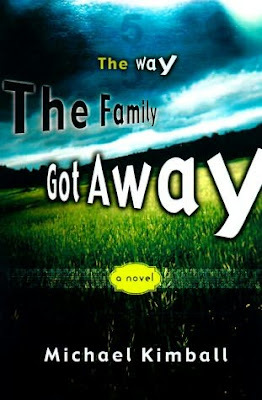 M. Kimball, The Way the Family Got Away. New York: Four Walls Eight Windows, 2000. Fiction. 143 pages. Michael Kimball breathes life into American experimental fiction in this moving debut novel. The tale reads on one level like timeless myth-making, as the family makes its way from Texas to Michigan with their infant child, a few days past his funeral, in the car trunk. But the unusual narration, and Kimball's adeptness at imparting grief through both the telling and the silences, make "The Way the Family Got Away" the freshest literary fiction. The stories of the death, the family, and the trip north are told through the alternating voices of the surviving young brother and sister: The brother tells the tale in terms of which possessions the family must barter to get from one town to the next, while the sister narrates the doll version of the family drama and hopes to bring her baby brother--magically--back to life. In Kimball's novel we find a domestic fiction more often rendered by women: an emotional tale of narrow parameters and deep impact. This writer is one to watch: Highly recommended for both academic libraries interested in literary or American fiction, and medium-to-large public libraries.